Many individuals sometimes complain of a ringing sensation or coming sensation within the ear. This condition is called as tinnitus and can have a significantly negative impact on the patient’s quality of life. There are a number of different causes of ringing ears and sinusitis is one such cause. Sinusitis refers to infection of the sinuses that can occur due to an allergy or some form of bacteria or virus. One of the associated symptoms with sinus infections is blocking of the Eustachian canal which connect the oral cavity to the inner ear. This canal is responsible for maintenance of pressure within the ear and patients can sometimes experience a feeling of a blocked ear when the eustachian canal is closed. The change in pressure within the ear can sometimes cause the ringing sensation. Let’s look at this aspect a little closer. 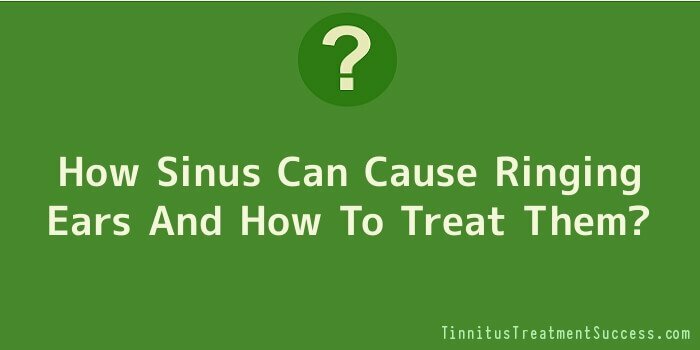 Sinuses are air filled cavities that are present within the skull. They are present around the nostril and within the confines of the scalp as well. An infection or inflammation of the sinuses can occur when bacteria or viruses enter the area and start to grow there. As a response, there is an increase in production of mucus and this can eventually block the sinuses completely. Over time, recurrent sinusitis or sinus infections can cause blockage of the eustachian tube and an alteration in the pressure as previously described. This results in a ringing sensation within the inner ear. Another reason has also been given for the development of ringing ears. When the sinuses are blocked, patients can become exceedingly sensitive to sound and the mild tinnitus that occurs can become a lot more obvious to the patient. There are some simple home strategies it can be adopted that can manage sinusitis and ringing ears. Firstly, patients with blocked sinuses can benefit tremendously from the use of steam inhalation. This helps loosen up the mucus and allows for free drainage from the sinuses. Stimulation can be easily achieved by using devices such as humidifiers or steam generators which run on electricity. They are available easily in most supermarkets and drugstores as well. Another method of getting rid of sinusitis is to take antihistamine drugs. These drugs must be taken only on prescription by a registered practitioner following clinical examination of the patient. Antihistamines can reduce the amount of secretions from the mucus glands within the sinuses and ultimately this helps clear them up. A clear sinus can help resolve ringing sensations within the ear fairly quickly. Sinus massage has also been shown to be of benefit. However, this needs be performed in conjunction with the above treatments. Gargling the mouth with warm water can also help get rid of the mucus within the nasal sinuses. Sinusitis and ringing ears are a common problem seen in a large number of individuals across the world.